1790– The first textile mill, built in Pawtucket, RI, is staffed entirely by children under the age of 12. 1834 to 1836– Workers at the Lowell Textile Mills, mostly unmarried young girls and young women, institute “turnouts” protesting wage cuts that had been instituted due to falling prices due to overproduction. See also http://www.fordham.edu/halsall/mod/robinson-lowell.asp See picture at right. 1842– The Massachusetts State Supreme Court ruled in Commonwealth v. Hunt that labor unions were not necessarily illegal conspiracies. 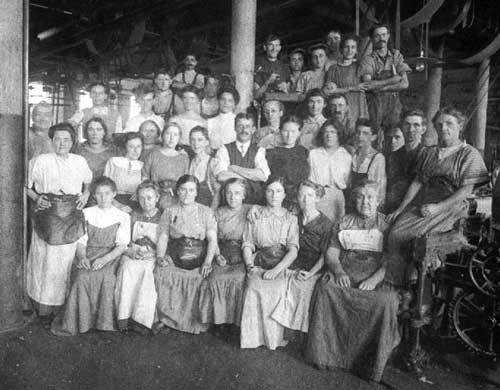 1845– The Female Labor Reform Association is formed in Lowell, Massachusetts by Sarah Bagley and other women cotton mill workers to reduce the work day from 12 or 13 hours a day to 10, and to improve sanitation and safety in the mills where they worked. 1866– The National Labor Union formed, the first national association of unions to succeed for any length of time. It included both skilled and unskilled workers. 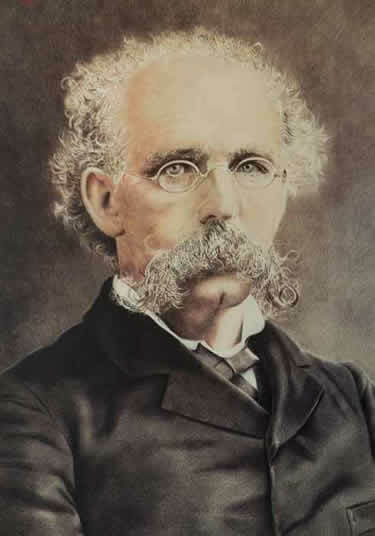 Terence Powderley and his mustache. 1869– The Noble Order of the Knights of Labor, a secret society, is organized in Philadelphia. Led by Terence Powderley from 1879, they accepted members of all races and both sexes. They pushed for the eight-hour day, abolition of child labor, equal pay for equal work, and political reforms including the graduated income tax. They would collapse after the Haymarket Square Affair. 1876– Leaders of the “Molly Maguires”, a violent secret society of Irish coal miners in Pennsylvania that had been infiltrated by a Pinkerton detective, were placed on trial for murder. A private corporation initiated the investigation through a private detective agency. A private police force arrested the alleged defenders, and private attorneys for the coal companies prosecuted them. The state provided only the courtroom and the gallows. On On June 21, 1877, (“Rope Day”) ten leaders of the Molly Maguires were hanged. 1877– The Great Railroad Strike of 1877, the first large railroad strike in US history, begins on July 14. A national uprising of railroad workers cripples the nation in response to the cutting of wages for the second time in a year by the Baltimore & Ohio (B & O) Railroad. It was also the first general strike, in which workers in other industries went on strike in solidarity with the striking workers. The governor of West Virginia sends in state militia, but they refused to use force against the strikers and the governor called for federal troops. President Rutherford B. Hayes sent federal troops from city to city. These troops suppressed strike after strike, until at last, approximately 45 days after it had started, the strike was over. This also spun off the Great St. Louis General Strike. 1886– In March, the Great Southwest Railroad Strike of 200,000 workers breaks out against the Union Pacific and Missouri Pacific railroads owned by Jay Gould, one of the more flamboyant of the ‘robber baron’ industrialists of the day. The failure of the strike led directly to the collapse of the Knights of Labor and the formation of the American Federation of Labor. –On May 1, in Chicago’s Haymarket Square, a bomb went off in the middle of a 1500-person protest rally against the killing of 4 strikers who had been on strike for the 8-hour day. Seven men were sentenced to death, even though it is unclear that labor activists had anything to do with the bombing. Only three were actually executed: one committed suicide before his execution and the other three were later pardoned. — On December 28, The American Federation of Labor is formed at a convention in Columbus, Ohio, representing 140,000 workers grouped in 25 national unions. Samuel Gompers is elected President. 1892– The Great Homestead Strike and Lockout takes place at the Carnegie Steel Works outside Pittsburgh, Pennsylvania against the Amalgamated Association of Iron, Steel & Tin Workers. Andrew Carnegie directs his manager, Henry Frick, not to renew the union contract. Frick turns the steel mills into “Fort Frick,” hires Pinkerton detectives (known for their brutality) to protect scabs and locks out union laborers. Strikers battle arriving Pinkertons, leaving 9 strikers and 7 Pinkertons dead. 1894– Eugene V. Debs leads the newly formed American Railway Union in a national strike against the Pullman Company. The strike and the union were finally broken by a court injunction and the intervention of federal troops. 1902– A huge anthracite coal strike of 147,000 coal miners shuts down eastern coal production, endangering hospitals, schools, and other public buildings. President Teddy Roosevelt mediates between the two sides at the White House and breaks tradition by not automatically siding with the business owners. Federal mediation of labor disputes is then launched. — The Colorado Labor Wars erupts as a series of conflicts spanning two years in what became known as the Colorado Labor Wars erupts in Colorado. Big Bill Haywood leads the Western Federation of Miners (WMF) through these troubles. 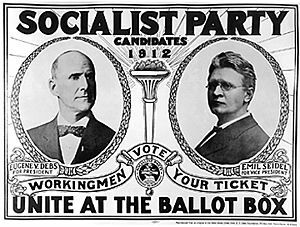 Both would become known as members of the Socialist Party, with Debs running for US president as the party’s candidate five times, from 1900- 1920, including from a jail cell in 1920, as Debs had been sentenced to ten years in prison for violating the Espionage Act of 1917 for giving a speech criticizing World War I (the text of that speech is elsewhere on this website). 1911– A fire breaks out at the Triangle Shirtwaist factory, which produces women’s dress shirts, killing 146 young men in gruesome fashion. The exit doors had been chained shut, and many young men hurl themselves from upper-story windows or die of smoke asphyxiation piled up near exit doors. This comes just 2 years after 20,000 shirtwaist workers had gone on strike. 1913– The Labor Department is created as a separate department from the commerce department. 1914– The Clayton Anti-Trust Act takes effect. It limits the use of injunctions in labor disputes and providing that picketing and other union activities are not illegal conspiracies or trusts.It is specifically targetting an interpretation of the Sherman Anti-Trust Act of 1890 which allowed business leaders to use the Sherman Act against workers’ organizations. AFL head Samuel Gompers refers to the Clayton Act as “Labor’s Magna Carta”. The Ludlow Massacre begins on April 20th. A combined force of Colorado National Guard and Rockefeller-owned Colorado Fuel & Iron Company guards kill 19-25 people, including several children, when they use a barrage of machine gun fire on a strikers’ tent village at Ludlow, Colorado. 1915 to 1918– The IWW undergoes a series of setbacks. In 1915, Joe Hill, IWW organizer and “labor’s troubador” was executed by firing squad in Utah on November 19, 1915 for a robbery and murder it is most unlikely he had anything to do with. In 1917, 17 IWW activists are horsewhipped while in police custody in Tulsa. In 1918, the leadership of the Industrial Workers of the World sentenced to federal prison on charges of disloyalty to the United States. –The Seattle General Strike of February 6 to February 11, 1919 by over 65,000 workers in several unions, dissatisfied after two years of World War I wage controls. — United Mine Workers’ organizer Fannie Sellins, a widowed mother of four, is shot to death by coal company guards while leading strikers in Brackenridge, Pennsylvania. — A strike by 1,100 police in Boston is the first ever by public safety workers. It was broken when Governor Calvin Coolidge summoned the entire Massachusetts Guard (launching his national political aspirations). — The Great Steel Strike against U.S. Steel Corp. led by the Amalgamated Association of Iron, Steel and Tin Workers begins. Starting in Chicago, it spread to 350,000 workers throughout Indiana, Ohio, Pennsylvania and West Virginia and lasted from September 1919 to January 1920. It was broken by massive use of scabs. — The Palmer Raids: on November 7 Attorney General A. Mitchell Palmer ordered raids by the Federal Department of Justice in 30 cities across the United States to arrest and deport suspicious immigrants (so called “alien reds”) many of whom were involved in US labor unions. The raids were coordinated by a young J. Edgar Hoover, Palmer’s chief investigating officer. In all, he rounded up about 10,000 and deported many as foreign agitators, anarchists, communists. 1926– The Railway Labor Act, required employers to bargain collectively and not discriminate against their employees for joining a union and outlawing “yellow-dog” contracts, was passed. 1935– The National Labor Relations Act (Wagner Act) is passed, establishing the National Labor Relations Board, which ensures that workers have the right to unionize and not suffer under unfair business practices. Six affiliated unions of the AFL form a Committee for Industrial Organizing to expand the scope of the AFL beyond its craft-union orientation. 1936– A “sitdown strike” of auto workers who are members of the United Auto Workers (UAW), supported by the Women’s Emergency Brigade, shuts down the assembly lines at the General Motors plant in Flint, Michigan. 1943– As a wartime measure, Congress passes the Smith-Connally Act to restrict labor bargaining and organizing. It would have required 30 day “cooling off” before strike, criminal penalties for encouraging strikes, Presidential seizure of struck plants, prohibitions against union campaign contributions. It is vetoed by President Roosevelt. 1946– A national railway strike brings almost all train traffic to a halt. President Harry S. Truman takes over railways and settles the dispute. 1947– As part of a postwar conservative political realignment, on June 23, The Taft-Hartley Act passed over President Truman’s veto, drastically amending the Wagner Act of 1935 reducing rights of workers to organize labor unions. State “right-to-work” laws appear. “Right-to-work” laws make it harder for unions to organize. 1952– A 55 day steel workers’ strike is ended by Federal Government intervention authorized by President Harry Truman. 1955– The American Federation of Labor merges with the Congress of Industrial Organizations, to form the AFL-CIO, the world’s largest labor federation. 1959– The longest steel strike in U.S. history shuts down 90% of US steel production for 116 days. 1963– The Equal Pay Act is signed into law and requires that female workers be paid the same wage as male workers for the same job. 1965– The United Farmworkers is formed by Cesar Chavez and Dolores Huerta. It launches a 1970 boycott of 25 major growers of table grapes in California. 1971– The Occupational Safety and Health Act is passed on April 28. 1973 to 1974– Two female workers who attempt to improve worker rights and safety take their actions which later result in having movies made about them. Crystal Lee Jordan is fired for trying to organize a union at the J.P. Stevens plant in Roanoke Rapids, North Carolina. The 1979 movie about her struggles, Norma Rae, later was nominated for 8 Academy Awards, winning Best Actress and Best Original Song. Karen Silkwood, a lab technician at the Kerr-McGee Cimarron Fuel Fabrication plant and an officer of the Oil, Chemical, and Atomic Workers Union local in Oklahoma City dies mysteriously en route to a union meeting with a newspaper reporter to detail violations at the plant. The 1983 movie about her experiences, Silkwood, was nominated for 5 Academy Awards and won a Golden Globe for best supporting actress Cher. 1975– On July 1, Cesar Chavez and sixty supporters of the United Farm Workers embarked on a thousand-mile march across California to rally the state’s farm workers, many of whom are Hispanic and immigrant. Also, on July 30, former Teamsters union president Jimmy Hoffa disappears from the parking lot of a Detroit restaurant. Although presumed dead, his remains have never been found. 1981– The Professional Air Traffic Controllers Organization (PATCO) struck in defiance of the law. Newly elected President Ronald Reagan fired all the strikers and broke the union, sanctioning the practice of hiring “permanent replacements” for striking workers. Solidarity day labor rally draws 400,000 to the Mall in Washington D.C.
1989– A wildcat strike of the United Mine Workers of America against the Pittston Coal Group in Virginia spreads across coalfields in the eastern US, involving up to 50,000 miners in 11 states. Using non-violence and civil disobedience, the miners win a contract after a bitter nine-month struggle. 1993– A five day strike of 21,000 American Airlines’ flight attendants, virtually shutting the airline down, is ended when President Clinton persuades the owners to arbitrate the dispute. Federal Arbitration of labor disputes first became common under President Theodore Roosevelt during the Coal Strike of 1903. 1994– The Major League Players Association goes on strike against National and American League baseball team owners. It is the longest strike of professional athletes and lasts 232 days, wiping out the 1994 World Series, and infuriating fans. 2001 to 2005– Several unions disaffiliate from the AFL-CIO, including the half-million member United Brotherhood of Carpenters and Joiners and in 2005, the 1.7 million member Service Employees International Union and the 1.3 million member International Brotherhood of Teamsters. 1. How were women’s economic lives limited in Massachusetts at this time? Be specific. 2. Why did the girls strike? What impact did this have? One of the girls stood on a pump and gave vent to the feelings of her companions in a neat speech, declaring that it was their duty to resist all attempts at cutting down the wages. This was the first time a woman had spoken in public in Lowell, and the event caused surprise and consternation among her audience. Harriet H. Robinson, “Early Factory Labor in New England,” in Massachusetts Bureau of Statistics of Labor, Fourteenth Annual Report (Boston: Wright & Potter, 1883), pp. 380-82, 387-88, 391-92. In 1913, coal miners in Ludlow, Colorado, employed by Colorado Fuel and Iron Co owned by John D. Rockefeller, Jr. (the son of the founder of Standard Oil), went on strike to protest their wages, which they felt were too low. Making matters worse was that Ludlow was a company town, and employees lived in company-owned houses. They were paid in company scrip rather than US currency, thus tying them to the company store and its prices. The Colorado state militia opened fire with machine guns on the striking miners’ camp, and eventually buildings were put to the torch. The massacre ultimately killed three women and eleven children. Read a first-hand account here (http://historymatters.gmu.edu/d/5737/). The PBS companion site on the incident is here. The events of the Ludlow Massacre demonstrate the ruthlessness that was employed by employers in their attempts to crush strikes, and the often brutal cooperation of government authorities in supporting the interests of business over those of the working people. So he didn’t try so very hard. Florence Kelley Speaks Out on Child Labor and Woman Suffrage, Philadelphia, PA, July 22, 1905. 1. What are Kelley’s criticisms regarding child labor? 2. What connection does she make about labor laws and the right of women’s suffrage? 3. Think: Why would “no labor organization in this country ever [fail] to respond to an appeal for help in the freeing of children [from labor]? We have, in this country, two million children under the age of sixteen years who are earning their bread. They vary in age from six and seven years (in the cotton mills of Georgia) and eight, nine and ten years (in the coal-breakers of Pennsylvania), to fourteen, fifteen and sixteen years in more enlightened states. No other portion of the wage earning class increased so rapidly from decade to decade as the young girls from fourteen to twenty years. Men increase, women increase, youth increase, boys increase in the ranks of the breadwinners; but no contingent so doubles from census period to census period (both by percent and by count of heads), as does the contingent of girls between twelve and twenty years of age. They are in commerce, in offices, in manufacturing. Tonight while we sleep, several thousand little girls will be working in textile mills, all the night through, in the deafening noise of the spindles and the looms spinning and weaving cotton and wool, silks and ribbons for us to buy. In Alabama the law provides that a child under sixteen years of age shall not work in a cotton mill at night longer than eight hours, and Alabama does better in this respect than any other southern state. North and South Carolina and Georgia place no restriction upon the work of children at night; and while we sleep little white girls will be working tonight in the mills in those states, working eleven hours at night. In Georgia there is no restriction whatever! A girl of six or seven years, just tall enough to reach the bobbins, may work eleven hours by day or by night. And they will do so tonight, while we sleep. Nor is it only in the South that these things occur. Alabama does better than New Jersey. For Alabama limits the children’s work at night to eight hours, while New Jersey permits it all night long. Last year New Jersey took a long backward step. A good law was repealed which had required women and [children] to stop work at six in the evening and at noon on Friday. Now, therefore, in New Jersey, boys and girls, after their 14th birthday, enjoy the pitiful privilege of working all night long. In Pennsylvania, until last May it was lawful for children, 13 years of age, to work twelve hours at night. A little girl, on her thirteenth birthday, could start away from her home at half past five in the afternoon, carrying her pail of midnight luncheon as happier people carry their midday luncheon, and could work in the mill from six at night until six in the morning, without violating any law of the Commonwealth. If the mothers and the teachers in Georgia could vote, would the Georgia Legislature have refused at every session for the last three years to stop the work in the mills of children under twelve years of age? Would the New Jersey Legislature have passed that shameful repeal bill enabling girls of fourteen years to work all night, if the mothers in New Jersey were enfranchised? Until the mothers in the great industrial states are enfranchised, we shall none of us be able to free our consciences from participation in this great evil. No one in this room tonight can feel free from such participation. The children make our shoes in the shoe factories; they knit our stockings, our knitted underwear in the knitting factories. They spin and weave our cotton underwear in the cotton mills. Children braid straw for our hats, they spin and weave the silk and velvet wherewith we trim our hats. They stamp buckles and metal ornaments of all kinds, as well as pins and hat-pins. Under the sweating system, tiny children make artificial flowers and neckwear for us to buy. They carry bundles of garments from the factories to the tenements, little beasts of burden, robbed of school life that they may work for us. We do not wish this. We prefer to have our work done by men and women. But we are almost powerless. Not wholly powerless, however, are citizens who enjoy the right of petition. For myself, I shall use this power in every possible way until the right to the ballot is granted, and then I shall continue to use both. What can we do to free our consciences? There is one line of action by which we can do much. We can enlist the workingmen on behalf of our enfranchisement just in proportion as we strive with them to free the children. No labor organization in this country ever fails to respond to an appeal for help in the freeing of the children. For the sake of the children, for the Republic in which these children will vote after we are dead, and for the sake of our cause, we should enlist the workingmen voters, with us, in this task of freeing the children from toil!